Click the blue live chat status button on the very bottom right section of any page to chat with Steve or Ann. 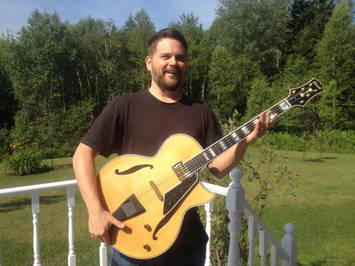 Will Kriski in stands proud with his new first generation Conti Guitar outside his home in beautiful Canada. After nearly giving up due to years of college and frustration, Will Kriski discovered the Conti approach to teaching and playing jazz guitar. Having advanced more than he ever thought possible in a short 5-6 month period, he created a group on Facebook where others could share their learning experiences too. If you’re on Facebook, simply click the button below to join Will’s continuously growing group. Sharing your experiences in Will’s group is the next best thing to spending time playing your guitar.